A numerical investigation of steady state heat transfer phenomenon in human tooth is carried out in this present study. The materials generally used for repairing human tooth are ceramics, gold, structural steel, and copper. These materials are considered for the three-dimensional heat transfer analysis. The shape of the teeth is considered as perfect cubic of dimensions 5mm X 5mm X 1.5mm. The simulation results show that the teeth are subjected to temperatures of varying nature in both X and Y directions whereas Z direction is same. It is found that the temperature is maximum at the top of the teeth and minimum at bottom of the teeth (i.e., root). The contours of the heat transfer analysis for various teeth materials shows that the layers of the teeth are subjected to varying temperature. It is also found that the heat transfer characteristics depend not only on shape and boundary conditions but also on the materials used for the teeth selection. Investigations on the material properties of soft and hard tissues such as its electrical properties, mechanical properties, optical properties and thermal properties is highly useful for understanding is structure, functions and cellular interactions (Kamalanand, Sridhar, Rajeshwari, & Ramakrishnan, 2010; Apparsamy, & Krishnamurthy, 2018; Krishnamurthy, Sridhar, Rajeshwari, & Swaminathan, 2009; Sahana, Paramasivam, & Kamalanand, 2017). Heat transfer phenomenon plays a major role in most of the fields of science and engineering including medicine (Kandlikar, Garimella, Li, Colin, & King, 2005). The analysis of temperature distribution in human teeth would be highly useful for the diagnosis of many dental diseases and also would provide useful information on the life of the teeth and its replacement (Wilkins & McCullough, 1989). Many materialswhich are subjected to heat transfer over a long period of time, would change the material characteristics, including its strength and lifetime. In particular, human teeth are made up of different materials and are subjected to thermal loads in day to day life at regular intervals (Brown, Dewey, & Jacobs, 1970). Proper understanding of the heat transfer phenomenon in human tooth will greatly help in the protection of human teeth for its increased lifetime and also to have a better understanding on artificial teeth. 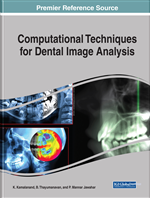 Hence, there is a need for the analysis of heat transfer phenomenon in dental materials (Lin, Liu, Niu, Xu, & Lu, 2011). A knowledge of the heat transfer phenomenonin teeth mayprovide more efficient ways to performsurgical procedures and toprevent certain tooth problems to some extent (Lin, Xu, Lu, & Bai, 2010). Based on different requirements, the Dentist can utilize materials with different compositions to fill a cavity in a patient’s teeth. For example, among different varieties of amalgam, metalamalgam and cast gold can be chosen as a material for filling (Torabinejad, & White, 1995). Due to recent advancements, dentists prefer certain advanced materials for use in dentistry (Moorthy, Hogg, Dowling, Grufferty, Benetti, & Fleming, 2012). As all the basic materials belong to same family most of the properties like strength, melting ranges, thermal conductivity, ductility, and electrical conductivity, are similar. The material properties such as brittleness in ceramics and flexibility in polymers are often utilized in dentistry for the development of dental materials (Lin, Liu, Niu, Xu, & Lu, 2011). Out of several materials, only three basic materials are more convenient for use. Theclassification of basic materials is presented in Figure 1. Figure 1 explains the general behaviour of the three basic materials such as metals, ceramics, and polymers. The properties of materials are important factors for selecting the materials to be used in the field of dentistry (Craig, & Powers, 1989). These materials are significantly tough and possess high stiffness or Young’s modulus. With these desirable properties, these materials are also used as repairing materials. But, metals are not usually preferred as repairing materials due to its high conductivity (Roberts, Berzins, Moore, & Charlton, 2009). On the other hand, ceramics and polymers are semi-transparent and exhibit lower heat transfer through the material. However, these materials are less strong and exhibit lower hardness when compared to metals (Anusavice, Shen, & Rawls, 2013). Since, a single material cannot have all the required properties, we go for composite materials for use in dentistry (Braden, & Clarke, 1984). A Dental resin composite filler material is formed by reinforcement of high thermal-expansion, low-strength, and low-elastic-modulus polymer with a low thermally expansion, high-strength, and high-elastic-modulus material (Blum, Lynch, & Wilson, 2014). Taking the advantages and disadvantages into account, the best material can be selected by analysing the material properties such as the thermal properties. Specific Heat (Cp): It is the amount of heat per unit mass is required to rise the temperature by one degree Celsius. Heat Flux (q): Flow of heat energy per unit of area per unit of time. Thermal Conductivity (K): Property of material to conduct heat. CATIA: Computer-aided three-dimensional interactive application. Anisotropy: Changes of thermal conductivity in all directions. Tooth Cavity: Caused by a combination of factors including bacteria in the mouth.